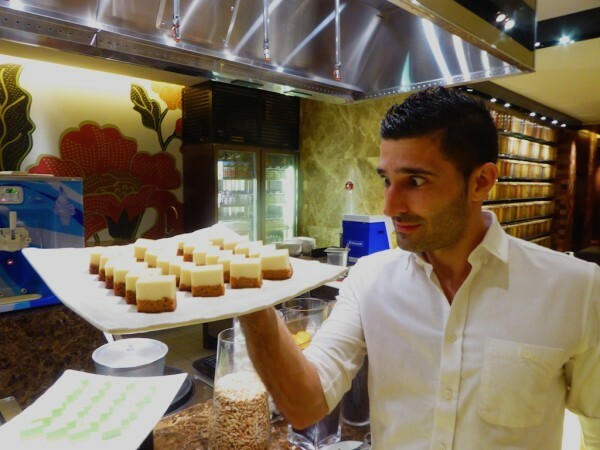 Malaysia is an amazing country for foodies. It's a melting pot of Chinese, Malay, Thai, Indian and many many more mixed into one yummy country to discover. We made a bunch of friends here, all willing to show us everything. And there's a lot! 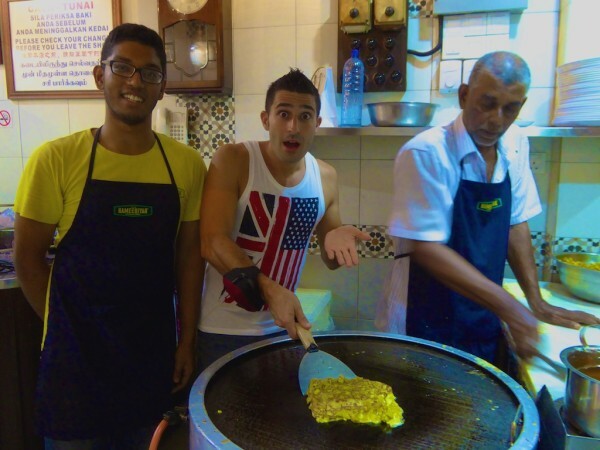 We simply couldn't do an article solely devoted to Malaysian food as it would be too long. 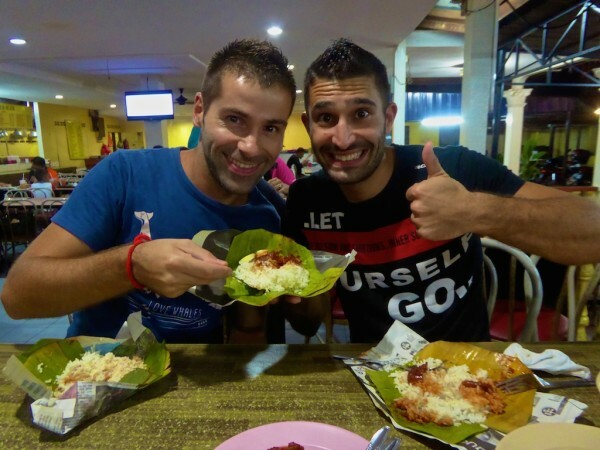 So we instead put together our favourite top 10 foods to try in Malaysia. Nasi lemak is the first of our top 10 foods to try in Malaysia because it's the national dish and one of the first you will come across. Nasi lemak literally means “fatty rice” because of the cooking process where rice is cooked in coconut milk with pandan leaves. It is traditionally served wrapped in a banana leaf, with ikan bilis (dried anchovies), sambal (a spicy sauce), boiled egg and roasted peanuts. Nasi lemak is a very heavy dish usually swimming in oil, which is probably why it's best reserved for breakfast time. Laksa definitely deserved its own spot in our 10 foods to try in Malaysia. We went quite loco for laksas in Malaysia. Laksa is a delicious rich broth with noodles, topped with a variety of condiments depending on the region. It is particularly popular in Penang and Sarawak, each with their own variation. The Assam laksa from Penang is distinct because it's more fishy and acidic. Assam means acidic in Malay, whereby tamarind is the souring agent. Thick rice noodles are usually used for Penang Assam Laksa. The Sarawak laksa uses coconut milk instead of a sour fish broth. It is served with either rice vermicelli noodles (bee hoon) or thick rice noodles. The Sarawak laksa is topped with crunchy fresh bean sprouts, strips of chicken, prawns and slivers of omelette. Mee kolok is another specialty from Kuching in Sarawak and a popular breakfast meal. It can be found at most hawker stalls throughout the city. Mee kolok comprises of egg noodles, which are boiled, strained, stirred with lard and topped with a few slices of roast pork. 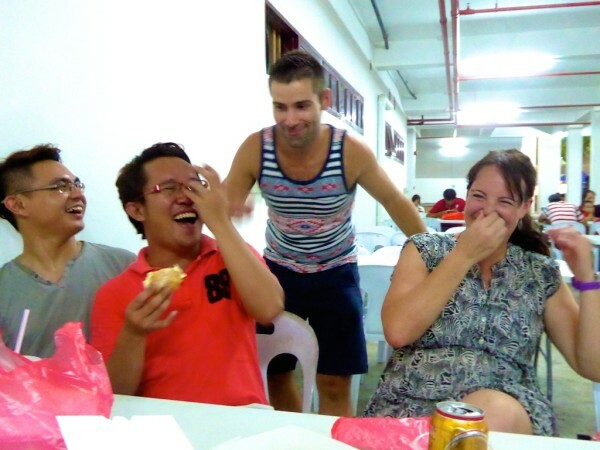 We had lots of mee kolok fun with our friends in Kuching. Roti canai (pronounced cha-nai) is one of the many Indian influences in Malay cuisine. It consists of flatbread (roti), served with a variety of yummy curries, usually dhal (lentils) and mutton/chicken. In Malay the word canai means “to roll out dough” – the dough usually contains lots of ghee (clarified butter), flour and water. 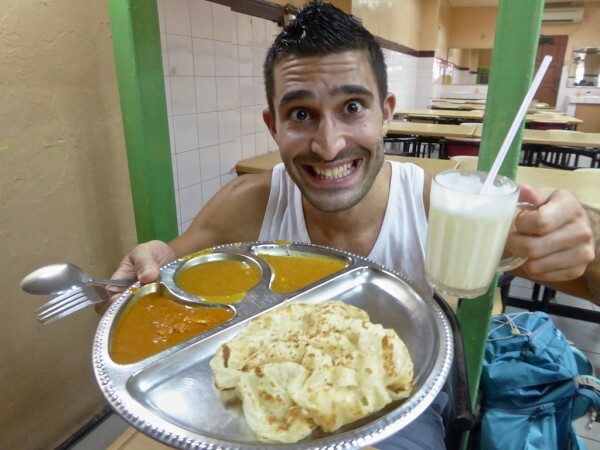 When we stayed in Little India in Kuala Lumpur, we had roti canai happy hour on our doorstep every morning. Murtabak is another Indian influence in Malaysia and is more commonly referred to as an Indian pizza. The name derives from the Arabic word mutabbaq which means ‘folded'. It's popular throughout the country and usually includes minced meat (beef, chicken or mutton), garlic, egg, onion with curry, sliced cucumber, syrup-pickled onions or tomato sauce. 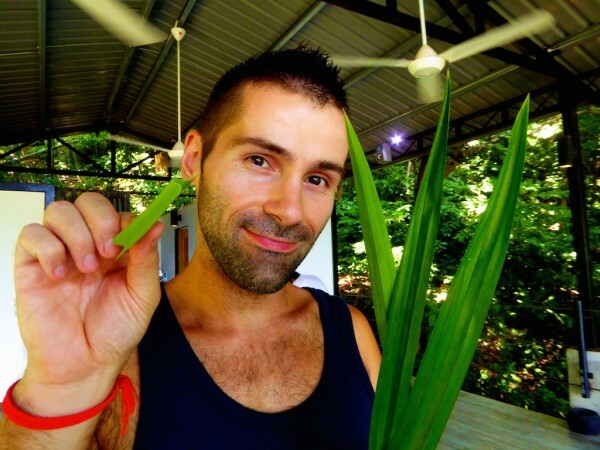 Pandan leaves are commonly used in Malaysian cuisine, particularly in desserts. It's often referred to as the Asian vanilla. Pandan pancakes were a common dessert we enjoyed during our adventures in Malaysia. But our favourite, and the reason why it has its place in our top foods to try in Malaysia, is layered pandan cake mixed with gula apong (palm sugar). 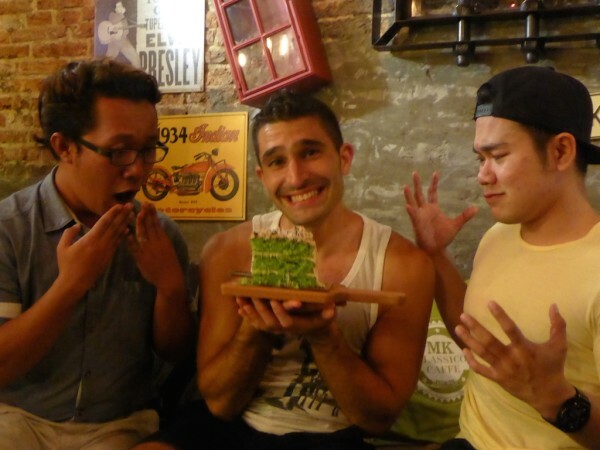 If you ever have the opportunity to try a Malaysian pandan gula apong cake, take Stefan's advice and just get one for yourself and never ever share it with anyone! Chendul is a popular Malaysian dessert similar to Filipino halo halo. To produce this delicious bowl of heaven, you need green rice flour noodles, coconut milk, shaved ice and red beans. The green colour comes from the pandan leaves. We tried some delicious chenduls as we ate our way through Penang. #8 BANANA CHEESE: bye bye abs! Banana cheese is simply banana fritters, topped with lots of grated cheese and swimming in condensed milk. It's very naughty: the bananas are battered, deep fried and all that condensed milk and grated cheese…goodbye abs! It's a popular snack for a light (!) tea break, particularly in Sarawak and Sabah. As coffee lovers we were delighted to discover how good the local brew in Malaysia is. It can be served either cold, with ice and plenty of condensed milk to produce a sweet, refreshing concoction. But the Nomadic Boys opted for a simple and healthier kopi-O (hot black coffee). 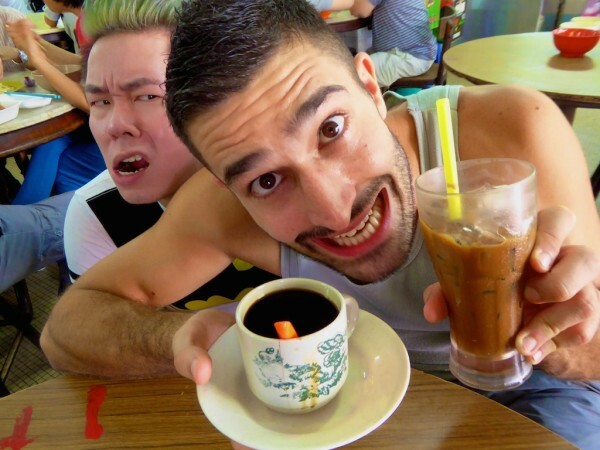 Ipoh is particularly famous for its coffee: we visited with our friend Kevin to enjoy several cold and hot brews. 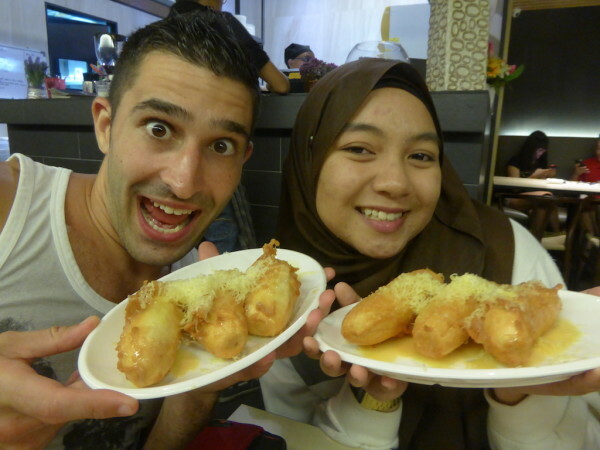 The final of our 10 foods to try in Malaysia is a subject which is guaranteed to get all tongues wagging. Everyone loves them (in Malaysia) or hates them (everywhere else). That's a slight exaggeration of course: we met many Malaysians who also hate durian passionately ha ha ha! 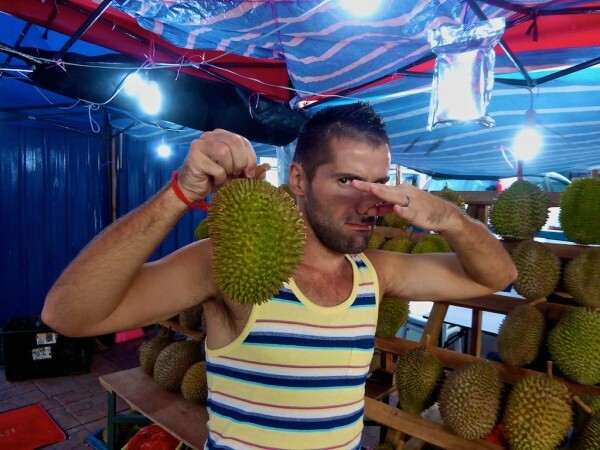 Durian is nicknamed the King of fruits because he's hunky, thorny and extremely potent! You can smell him from a mile away. In fact, durian is so potent that most hotels (and subway systems like in Singapore and Bangkok) ban them! 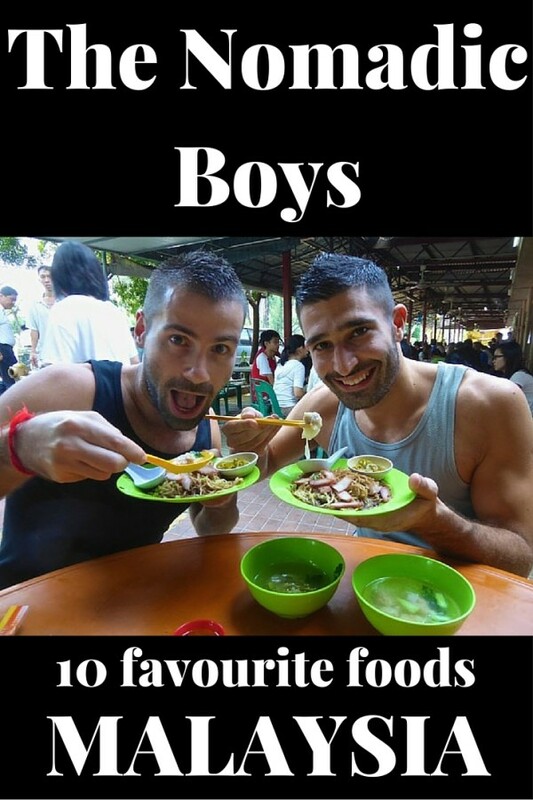 Next time you both have to try Rojak ( not the Indian Rojak) and Stinky Tofu! Guaranteed to get all tongues wagging also! ? Nasi Lemak is my favorite one for breakfast and Kolok Mee my second one!! Yum!! All of the food you have listed here looks deeeelicious!! The Nasi lemak sounds sooooo tasty as their National Dish!! Ha ha ha – so true 🙂 You’d love it in Malaysia! I live in Singapore but I still have never managed to eat durian. The smell is so off-putting! I don’t get chendol, such a weird texture flavour. Laksa, on the other hand, is one of my favourite things to eat! Fabulous post! I didn’t realize the mighty durian was banned from transit. Thanks Nancy. And not just from transit; from most hotels too! I have been to Malaysia but it was only for a brief time though. Hopefully I can get to visit again so that I can try your recommendations here! 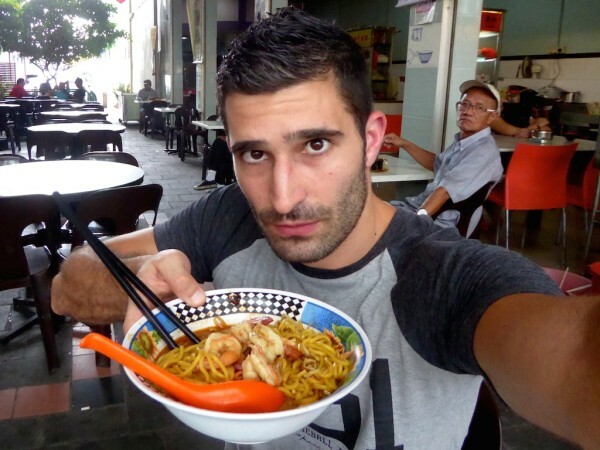 Hell yes I love Malaysian food! I said goodbye to the abs a long time ago so I have no guilt about indulging! Haha! Banana cheese? Yes, please! I love that a lot of the dishes use coconut milk and salty fish – the salty/sweet and sometimes funky combination makes Malaysian food irresistible, even if you don’t believe it before you try it!